The commitment to renewable 1.1% boost global growth. 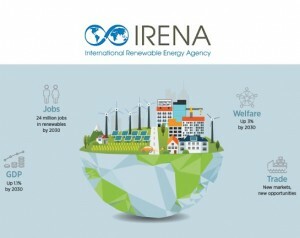 The International Renewable Energy Agency (IRENA) ensures that the commitment to double by 2030 would result in an increase of EUR 1.2 trillion of global GDP. According to the general director of IRENA, Adnan Z. Amin, “… achieve the necessary energy transition will not only reduce climate change, but also stimulate the economy, improve human welfare and promote employment in the world”. Access to the full interview at El País, 16 January 2016.